Sign-on and Safety Bonuses Available! Transervice Logistics Inc. offers a wide variety of driver jobs throughout the nation, most of which are rewarded with top union pay and benefits. There are jobs for safe, honest, hardworking individuals with Class A, B, and C Driver's licenses, and routes that include long-haul, short-haul and regional deliveries. Whether you prefer to be home every day, or over the road, there will be an opportunity for you to join our team. No matter your route or role with Transervice, you can be assured that your equipment will be modern, your training will be complete, your management team will be supportive and your co-workers will be friendly. ASE Certification Bonuses up to $13,500 Available! Or apply to one of our openings below. 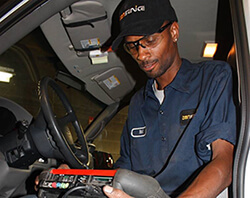 To keep our fleet of top-flight trucks and other modern equipment running as efficiently and effectively as possible, we hire the nation's finest diesel technicians. Working at more than 120 facilities throughout North America, our teams enjoy access to state-of-the-art equipment, ongoing training, a safe, OSHA-compliant work environment, supportive management and team members who help you to succeed. to find out more information!